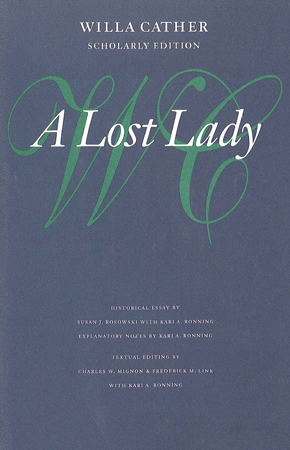 The Willa Cather Scholarly Edition of A Lost Lady is edited according to standards set by the Committee for Scholarly Editions of the Modern Language Association. A wide range of biographical, historical, and textual information about the novel is presented. The text is faithful to Cather's intentions; the textual essay describes the production and subsequent revisions of the text. The historical essay describes the origin, writing, and reception of the novel, as well as motion pictures that were later based on it. Explanatory notes identify locations, literary references, persons, historical events, and specialized terminology. A selection of archival photographs illuminates the connection between the novel and the people and places from Cather's formative years in Nebraska. Susan J. Rosowski (1942-2004). Rosowski was a professor of English at the University of Nebraska-Lincoln. Rosowski authored The Voyage Perilous: Willa Cather's Romantacism (1986) and series editor of Cather Studies, both published by the University of Nebraska Press. Kari A. Ronning is assistant editor of the Cather Scholarly Edition. Charles W. Mignon and Frederick M. Link are professors emeritus of English at the University of Nebraska.